Map of the Adriatic Sea showing border nations. 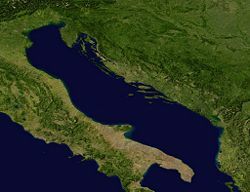 The Adriatic Sea is part of the Mediterranean Sea separating the Italian Peninsula from the Balkan peninsula, and the system of the Apennine Mountains from the Dinaric Alps and adjacent ranges. 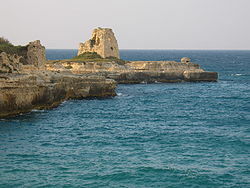 It extends from the Gulf of Venice south to the Strait of Otranto, linking it to the Ionian Sea. It has an approximate length of 500 miles (800 km), an average width of 100 miles (160 km), and an area of 50,590 sq mi (131,050 sq km). The sea's western coast runs the length of Italy, while the eastern coast forms the borders of Croatia, Bosnia and Herzegovina, Montenegro, and Albania. A small slice of Slovenia also reaches to the Adriatic Sea. Eleven major rivers flow into the Adriatic Sea. They are the Reno, Po, Adige, Brenta, Piave, Soča/Isonzo, Zrmanja, Krka, Cetina, Neretva, and the Drin (Drini). 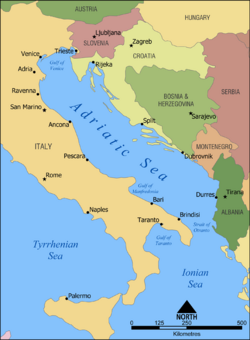 The Adriatic Sea has served as a source of transportation, recreation, and sustenance throughout history. From the end of the twentieth century the Adriatic, long renowned for its pristine condition, began to show perilous signs of invasive species introduced by human influence. Six nations border the Adriatic Sea. For the sake of maintaining this important body of water, it is incumbent upon them to unite beyond their national boundaries. A satellite image of the Adriatic Sea. The name has existed since antiquity; in the Latin of the Romans (Ancient Latin) it was Mare Superum; in medieval Latin it was Mare Hadriaticum or Mare Adriaticum. The name, derived from the Etruscan colony of Adria (or Hadria), originally designated only the upper portion of the sea,  but was gradually extended as the Syracusan colonies gained in importance. The word Adria probably derives from the Illyrian word adur meaning "water" or "sea." But even then the Adriatic in the narrower sense only extended as far as the Monte Gargano, the outer portion being called the Ionian Sea. The name was sometimes, however, inaccurately used to include the Gulf of Tarentum (the modern-day Gulf of Taranto), the Sea of Sicily, the Gulf of Corinth and even the sea between Crete and Malta. The Adriatic Sea is situated largely between the eastern coast of Italy and the western coast of Croatia, both major tourist attractions. It was used by the ancient Romans to transport goods, including animals and slaves, to Ostia, the Roman port. Map of the Mediterranean Sea, showing the location of the Adriatic in relation to other bodies of water in the region. The Adriatic extends northwest from 40° to 45° 45' N., with an extreme length of about 770 km (415 nautical miles, 480 mi). It has a mean breadth of about 160 km (85 nautical miles, 100 mi), although the Strait of Otranto, through which it connects at the south with the Ionian Sea, is only 45-55 nautical miles wide (85-100 km). The chain of islands which fringes the northern section of the eastern shore reduces the extreme breadth of open sea in this area to 145 km (78 nm, 90 mi). Its total surface area is about 60,000 square miles (160,000 km²). The northern part of the sea is very shallow, and between the southern promontories of Istria and Rimini the depth rarely exceeds 46 m (25 fathoms). Between Šibenik and Ortona a well-marked depression occurs, a considerable area of which exceeds 180 m (100 fathoms) in depth. From a point between Korčula and the north shore of the spur of Monte Gargano there is a ridge giving shallower water, and a broken chain of a few islets extends across the sea. The deepest part of the sea lies east of Monte Gargano, south of Dubrovnik, and west of Durrës where a large basin gives depths of 900 m (500 fathoms) and upwards, and a small area in the south of this basin falls below 1,460 m (800 fathoms). The mean depth of the sea is estimated at 240 m (133 fathoms). The east and west coasts of the Adriatic vary greatly. The west shore, along Italy, is relatively straight, continuous, and generally low, merging in the northwest, into the marshes and lagoons on either hand of the protruding delta of the River Po, the sediment of which has pushed forward the coastline for several miles within historic times—Adria is now some distance from the shore. The east coast along the Balkan Peninsula is generally bold and rocky, with over one thousand islands varying in size. Numerous straits form inlets between the islands similar to those of the Norwegian fjords, forming an intricate coastline. South of the Istrian Peninsula, which separates the Gulfs of Venice and Gulf of Trieste from the Bay of Kvarner, the island-fringe of the east coast extends as far south as Dubrovnik. The islands, which are long and narrow (the long axis lying parallel with the coast of the mainland), rise rather abruptly to elevations of a few hundred feet, with the exception of a few larger islands such as Brač (Vidova gora, 778 m) or the peninsula Pelješac (St. Ilija, 961 m). There are over a thousand islands in the Adriatic, 66 of which are inhabited. On the mainland, notably in the Gulf of Kotor (Boka Kotorska; named after the town of Kotor), lofty mountains often fall directly to the sea. The prevalent color of the rocks is a light, dead grey, contrasting harshly with the dark vegetation, which on some of the islands is luxuriant. Attesting to this, Montenegro (Black Mountain) was named for the black pines that cover the coast there, and similarly the Greek name for the island of Korčula is Korkyra Melaina meaning "Black Corfu." Notable cities on the Italian coast are Trieste, Ravenna, Rimini, Ancona, Pescara, Bari, and Brindisi. The city of Venice stretches across numerous small islands in the marshy Venetian Lagoon, which stretches along the shoreline of the Adriatic in northeast Italy between the mouths of the Po (south) and the Piave (north) Rivers. Major cities on the northeastern coast include Trieste in Italy; Koper in Slovenia; Umag, Poreč, Rovinj, Pula, Opatija, Rijeka, Senj, Zadar, Biograd, Šibenik, Trogir, Split, Makarska, Ploče and Dubrovnik in Croatia; Neum in Bosnia and Herzegovina; Herceg Novi, Kotor, Tivat, Bar, Budva and Ulcinj in Montenegro; and Durrës in Albania. 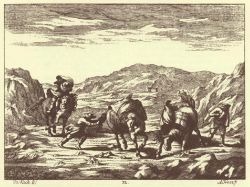 The bora on the Kras as depicted in Valvasor's Glory, seventeenth century. There are eight basic wind types prevalent in the Mediterranean region. Three of these are common to the Adriatic; the bora, the sirocco, and the maestro. The Bora is a northern to north-eastern katabatic wind in the Adriatic, Croatia, Italy, Greece, and Turkey. Its name derives from the Greek mythological figure of Boreas, the North Wind. The changeable Bora often blows throughout Dalmatia and the Adriatic east coast. It is a gusty wind, most common during the winter season. The area where some of the strongest bora winds occur is the Velebit mountain range in Croatia. The wind is also an integral feature of Slovenia's Vipava Valley and Kras region, (the Carso in Italy), an area of limestone heights over the Trieste Bay stretching towards the Istrian peninsula. Because the region separates the lower Adriatic coast from the Julian Alps range, extreme bora winds often occur there. They have influenced the region's traditional lifestyle and architecture. Towns on the coast are built densely with narrow streets in part because of the wind. Buildings in several towns and villages in Slovenia and the Province of Trieste (Italy) have stones on their roofs to prevent the roof tiles from being blown off. The bora, along with the prevalent sudden squalls are dangers to winter navigation in the Adriatic. The Sirocco arises from a warm, dry, tropical airmass that is pulled northward by low-pressure cells moving eastward across the Mediterranean Sea, with the wind originating in the Arabian or Sahara Deserts. It often reaches hurricane speeds in North Africa and Southern Europe. The Sirocco causes dusty, dry conditions along the northern coast of Africa, storms in the Mediterranean Sea, and cold, wet weather in Europe. The Sirocco's duration may be a half day or many days. Many people attribute health problems to the Sirocco either because of the heat and dust along the African coastal regions or the cool dampness in Europe. The dust within the Sirocco winds can degrade mechanical devices and invade domiciles. They are most common during the autumn and the spring, though when they do occur in winter they often bring rain. The Maestro is a northwesterly wind which blows in summer in the Adriatic when pressure is low over the Balkan Peninsula. It is a fresh breeze accompanied by clear weather and light clouds. It is not to be confused with mistral, a quite different (although also northwesterly) wind in southern France. The maestro is the most favored summer wind as far south as western Crete where it supposedly blows only during daytime. Croatia's coastline on the Adriatic Sea spans over 6,200 kilometers (3852.5 miles) including some 1,200 islands, islets, and reefs. This translates to that country's ownership of approximately 75 percent of the Adriatic coastline. Croatia's most important industry is tourism, and is based largely on the preserved and clean marine environment of the Sea. Its adjacent coastal area is also rich in historical and cultural heritage. As a geographically protected arm of the Mediterranean Sea, the Adriatic has suffered less environmental harm than the Mediterranean itself. Croatia especially, due to its economic dependence on the Sea, has taken measures aimed at keeping it clean. The islands on the Sea's eastern side were once considered a paradise for divers due to beds of dazzling coral and mollusks. However, the once pristine sea bottom is being covered by a green carpeting of algae. Caulerpa Racemosa, an invasive algae prevalent in the Mediterranean, has begun to invade the Adriatic in the early years of the twenty-first century. This rapidly growing algae reduces the variety and abundance of underwater plant and animal life. As flora is destroyed, the survival of fish and mollusks is at peril. A tropical species originating in the Red Sea, this algae was carried into Mediterranean waters and eventually into the Adriatic on the bottoms of ships, their anchors, and on fishing nets and diving equipment. Nations bordering the Mediterranean such as Spain, France, and Cyprus, have banded together to control this problem. The Adriatic, with six border nations, needs to see similar international cooperation in order to restore the cleanliness of the Sea. Adriatic Sea viewed from Croatia. ↑ Herodotus vi. 127, vii. 20, ix. 92; Euripides, Hippolytus, 736. ↑ Ebenezer Cobham Brewer, Brewer's Dictionary of Names (Hodder Arnold, 1999, ISBN 978-1859863237), 7. ↑ 4.0 4.1 Adriatic Sea and a plague of invasive algae Find-Croatia, 2007. Retrieved August 20, 2018. 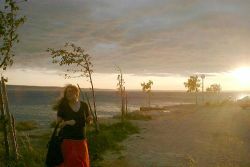 1yachtua.com. Local Mediterranean winds. Retrieved August 20, 2018. Denham, H. M. The Adriatic: A Sea-guide to its Coasts and Islands. London: Murray, 1967. Find Croatia. Adriatic Sea. Retrieved August 20, 2018. Golden Gate Weather Services. Name of Winds. Retrieved August 20, 2018. Satellite images and maps of Adriatic Sea. GeaBios. GIS Public Service. Weather forecast for eastern coast. GeaBios. GIS Public Service. This page was last modified on 20 August 2018, at 19:44.